Steel hibachi charcoal grill / barbecue for camping / gardens / patios etc CMP11 by A B Tools at Kerinci. MPN: CMP11. Hurry! Limited time offer. Offer valid only while supplies last. Easy to assemble barbecue ideal for garden / picnics / beach / camping and caravanning. Comes complete with wind shield. Chrome plated cooking grid. 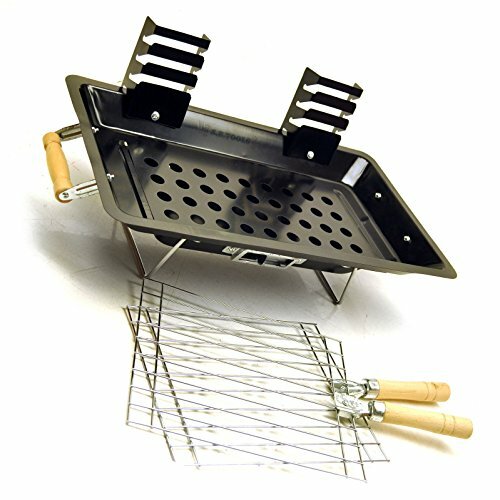 Easy to assemble barbecue ideal for garden / picnics / beach / camping and caravanning. Comes complete with wind shield. Grill dimensions 31cm x 18cm / 14" x 7" (approximately). Overall height 21cm / 8" (approximately). Cooking height 19cm / 7.5" (approximately). Lightweight and comes with a box for easy storage and transportation. Comes complete with instructions for easy assembly.